LAKE PLACID, New York – SuperEval, the online educational leadership evaluation tool that advances district goals and improves leadership team communication through a collaborative and evidence-based process, will be showcased at the New York State School Board Association’s 98th Annual Convention and Education Expo in Lake Placid, NY October 12 – 14, 2017. 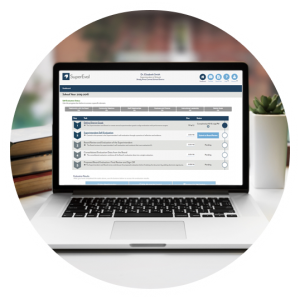 Developed in 2015 as the digital platform for The COUNCIL’s Superintendent Model Evaluation, SuperEval has evolved to include evaluations for principals and central office administrators. More than 2,000 school board members and school leaders from across New York are expected to attend this year’s NYSSBA Convention, themed Taking Education to New Heights. Michael Horning, Jr., Executive Vice President of PLS 3rd Learning, will explore the best practices that are foundational to SuperEval in his presentation “SuperEval: The Online Superintendent Evaluation System,” which will be held on Saturday, October 14 at Intervale Conference Center. SuperEval will also have a booth located on the expo floor at the NYSSBA Convention featuring live evaluation tool demonstrations, giveaways, and more information for attendees. In September, SuperEval partnered with the Pennsylvania Principals Association to bring the online evaluation tool to administrators across the Commonwealth. SuperEval is available now for principal, superintendent, and central office administrator evaluations. Visit SuperEval.com for more information. PLS 3rd Learning is an organization dedicated to the development and advancement of K-12 education. We are a team of educators and technology specialists who imagine, design, and deliver unique technology systems that inspire school leaders and teachers across the world.